Is there a way to have LTC mining done through cgminer, and BTC mining done through cpuminer? Kind of the reverse of how you have it? Is it possible to fork the Vertcion mining version of cgminer to make it work with the Gridseed ASICs? No, these devices are only capable of Scrypt or SHA-256 mining. ps, if you forgot your com number try “gc3355=STM32″ even works for multiple instances with multiple devices… handy if you cant be arsed to start again! Will, thanks for the tip. We’ve noticed you could set different frequencies, though not sure if the device actually runs with different ones for BTC and LTC. The fact that cpuminer makes it hard to guess what the actual hashrate is doesn’t help. I can only get two grid seeds to run. I seems to be a driver issue or issue with zadig. The seeds show up as stm32 in the device manager, but cgminer gives an error and refuses to start. Cpuminer “sees” the seeds and sends work, but no of it seems to come back. It just detects new stratum blocks. Mike, there are people running 20 and even more of these, so yes. @ Mike – Here’s what works for me with 3 gridseeds (after replacing STM with WinUSB using Zadig): All Gridseeds unplugged. Set –hotplug=5 in cgminer bat. Start cgminer. Plug power into each gridseed. Plug USB into each gridseed one at a time waiting until cgminer sees each one. All will be working in cgminer now. Then start one cpuminer for each gridseed. @ Will – What kH/s (from pool) are you getting with cpuminer at 750 freq? 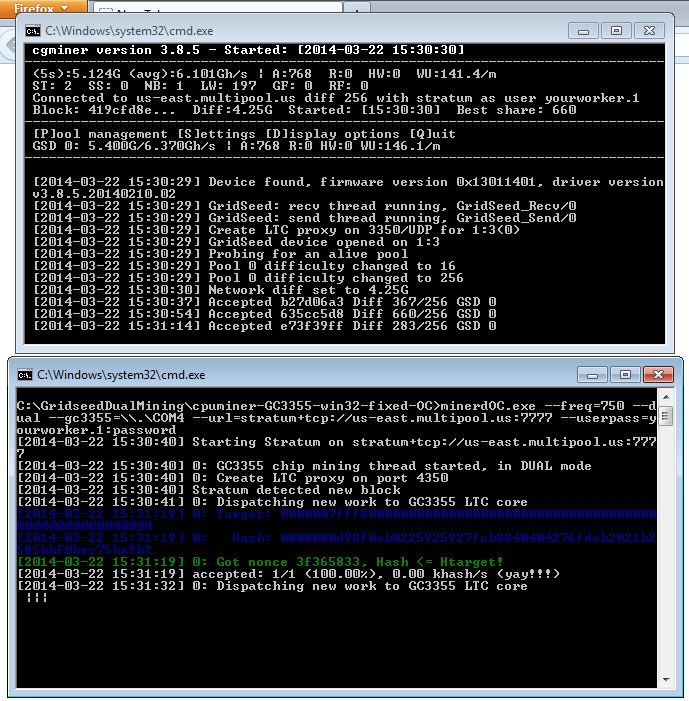 In dual mode, I’m getting less than 300 kH/s (scrypt) each with 600 cgminer & 850 cpuminer. @ admin – Can we set individual frequencies by gridseed serial number in this build of cgminer 3.8.5? Thank’s I’ll give that a try. device detection seems to be my problem. I am happy with the speed I’m getting on the ones that I was able to get running in dual mode. I have about 9gh/s at 750 and 320kh/s at 850. I was getting a lot of scrypt errors at any speed until I lowered the btc to 750mhz. Will & everyone – thanks for the info re: all at 750. It looks like everything is a bit faster now. I don’t think the devices understood different frequencies for cgminer and cpuminer. I had them at cgminer 600 and cpuminer 850 and the power consumption at the outlet with a PC was 180 watts. Now, at at cgminer 750 and cpuminer 750 power consumption is 218 watts. cgminer 800 works but cpuminer doesn’t like 800. 775 might be the magic number but I don’t know if that is available in this build of cgminer. 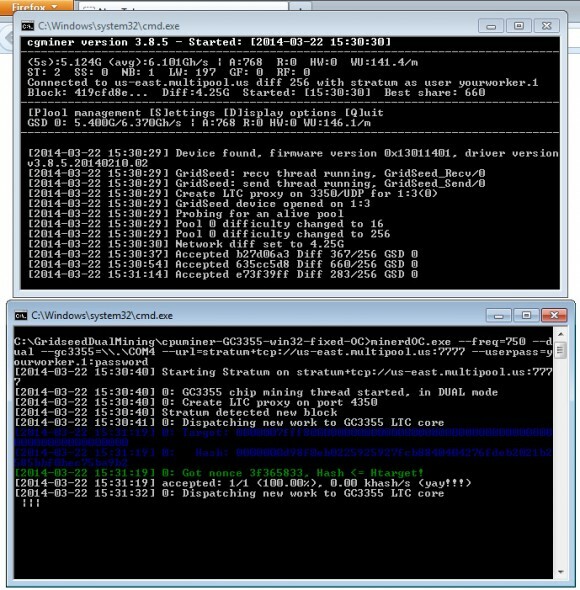 Guys do note that when you run the cgminer 3.8.5 for BTC mining it does set the operating frequency for both the BTC and LTC mining, these are set separately, but cgminer 3.8.5 sets them to be the same. After that when you run cpuminer it can change only the LTC frequency. When you run dual mining mode the highest problem free (no HW errors) operating frequency for the LTC cores is lower than when running the miner in Scrypt only mode. The cgminer 3.8.5 for Gridseed BTC mining does support the following frequencies: 250, 400, 450, 500, 550, 600, 650, 700, 750, 800, 850 and 900. Setting any other frequency will default to 600 MHz. There is not point in frequencies higher than 900 MHz as you would probably not be able to get the device stable in dual mining mode at even 800 MHz. It is not wise idea to dualmine on voltmoded devices as this might get the VRMs of the ASIC too hot and can result in hardware damage, it can also cause issues with the power supply if you are sing one that is rated for 60W! Miner, thanks man. you hit the nail on the head. I changed hotswap to 5 and added them one at a time with cgminerbtc running. Worked like a charm. Hopefully I dont need to do that after every restart, but it runing 11 seeds in dual mode now. That’s great. I do it that way because I only have 3 and they’re not on a hub so I have to plug them in individually anyway. When I get a hub I’ll try starting cgminer then plugging the hub in to see if that works. I’ve been using custom builds of cgminer/cpuminer on my OpenWRT ALIX board for 10 days. The only errors I’ve encountered have been with my crappy choice of pool (gnash). If you feel you must use Windows, maybe try VirtualBox/Ubuntu so you don’t have to deal with virtual coms/drivers. There are many resources out there for building your own miners with Linux. I’ve never had good luck with Cygwin or MinGW for Windows builds. 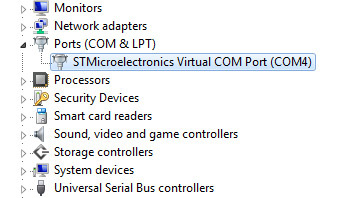 Hi, How come my miners are listed under the USB tab(Universal Serial Port Devices) and not in the Com port tab. I can not change the com port number as there is no option for this under the USB section. Lists them as STM32 virtual com port devce. I tried downloading the dual package, but it says you need a password to unzip. Am I doing something wrong? I also tried to download the original cgminer 3.8.5 for dual BTC mining from a previous post (https://cryptomining-blog.com/wp-content/files/cgminer-3-8-5-gridseed-windows.zip) but it says this link is no longer valid. My gridseeds are up and running great in Scrypt mode only – looking to run them in both scrypt and BTC mode. Any help is greatly appreciated. Michael K, try again now, it should be working fine again. Something messed up with the file permissions. I cannot get it to dual mine i think the guide is missing something. Cpuminer needs one driver i can install that and get it to work. Cgminer needs the winusb driver I can get that to work. I cannot get both to work since is cpuminer is working cg cannot ditect it but to wrong drivers. If I start with cg cpuminer cannot connect since there is not comport due to the win usb drivers. Sean, you need to note the COM port number before replacing the driver with Zadig, and after that to set that same COM port to cpuminer and it should work. I cant get this to work either, my gridseed wont mine BTC for some reason. I can mine LTC by itself but the second I follow your instructions and fire up the BTC miner it appears as if its going to work. However I get 0 shares, all are stale / invalid shares… any ideas? This particular link contains a trojan virus. Don’t run it. The trojan doesn’t unpack until you execute the bat file. The definition name is IDP.trojan.A3582C8B. John, This is a common problem, most antivirus software detects and reports many of the miners based on cpuminer, cgminer etc. as possible viruses. If you wish you could just compile the miners from source yourself, but you’d still get the same warnings. What is the best way to dual mine on a raspberry pi? can also be related to having more gridseed launch cgminer selecting only one or take them all? I work regularly with 1, 3 are connected when I get stuck all ..
89transam1234: you have to make your own bat files. Usually when you unpack a package, they have a sample bat file in there but you will have to modify it with your info. hi i am trying to run solo bitcoin mining on the gridseed when i plug two in they instantly run 11 ghash but gives me no shares i am running on difficulty 32 and when i run 1 it gives m 6 ghash then i get shares i dont understand it im not sure what i am doing wrong ? . Gridseeds are already pretty slow in terms of hashrate for mining either LTC or BTC, they need very low difficulty in order to get shares with their little hashrate.